Amethyst was made popular by the iPig iPod speaker dock. 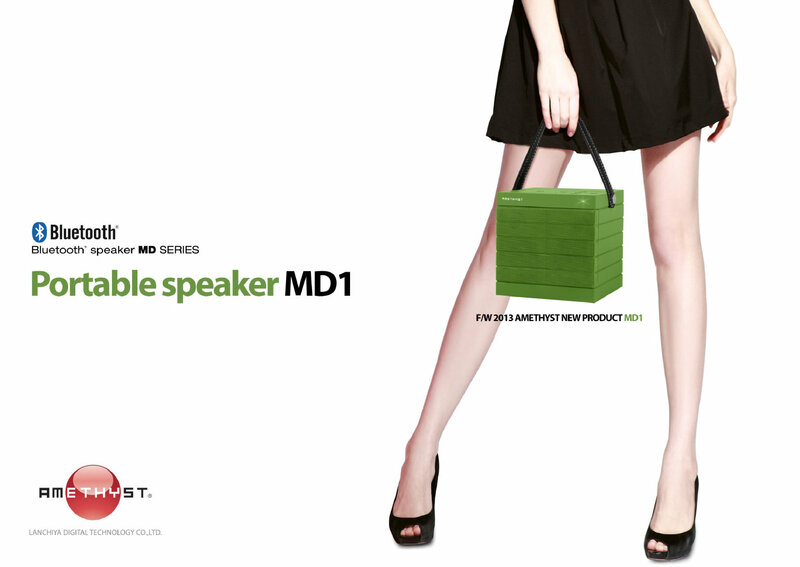 Still selling in many online stores, including Amazon, a new series of speakers will be available in Singapore. Here's an exclusive review on the 2 speakers. The MD1 is far from the Audyssey's quality, but so is the price. Retailing below S$200 (Audyssey is priced above S$600), the MD1 is powered by battery and comes with a leather-textured handle. The surface all around is rubber texture except the front which is strong metal mesh grill, and the combination seems to be rather effective in protecting the unit. The top face of MD1 is where the touch buttons are located. Besides the usual music controls (volume, play/pause, tracks), there is an "input" button to switch sources, a "pair" button to activate Bluetooth pairing, a call button for making calls. The microphone can be seen as 3 small holes. There are 2 tweeters, 2 mid-range and 1 sub-woofer facing below the unit. This allows the MD1 to deliver punchy sounds, yet without sounding noisy. I find the low and mid-range frequency outshines the treble, so when playing tracks without sufficient sparkle, for instance, vocal, the audio could sound a tad muffled. That however could be seen as a plus point, as the music plays pleasantly in the background rather than sounding piercing. Thanks to the handy handle, I could carry everywhere I go around the house - even at the bathroom. I like the MD1 because it is portable, hardy and affordable. 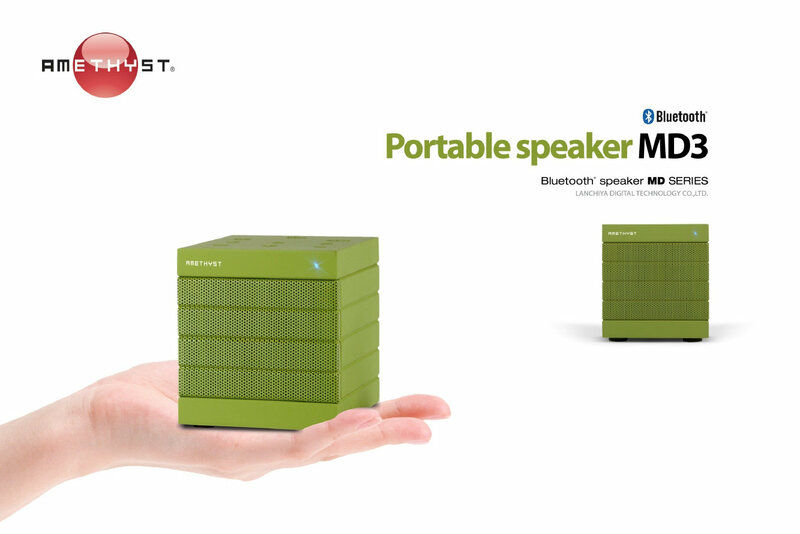 I can bring it for picnics, for roadshow events, it offers multiple connectivity, supports voice call. Its large size means it delivers more powerful low-mid range which smaller speakers could not achieve. What's more amazing is that you get all these for a fraction of a price compared to established names. I just hope the voice prompt volume can be reduced. The MD3 looks just like the MD1 except it's smaller and only has a single speaker unit. For that, you get lesser kick at the low range, the mid-range is not as forthcoming, and you don't get stereo output. But otherwise, the audio output is equally punchy, and the treble sounds clearer than the MD1. All the MD1's input handling and connection features are also available. Between the MD1 and MD3, I am more attracted to the MD1. You might wonder why I prefer a larger speaker that is not baggable, a feature that many other brands try to achieve. It is precisely the large size that made me like MD1. The MD3, on the other hand, is small, just like many brands in the market. If I demand a small speaker with big sounds, I would probably be paying good dollar. If I don't care for audio fidelity, I might be satisfied with a lower-priced knock-off. Without enough review experience in the wireless portable speaker market, I cannot say for sure whether there are better products for that price. On the other hand, I believe there are no portable speakers in the market with the size of MD1 and for that price.